In my last post, I talked about a nifty little program called Restoration. One thing I didn’t mention, was that the program had changed the first letter of most of the restored files to $. Most of the files we restored were photos, and I knew that all of these started with the letter I.
I wanted to make sure that the filenames of all of the files were correct keeping in mind how the OS sorts the files. However, there were 220 of them, and renaming them manually would be a hassle. 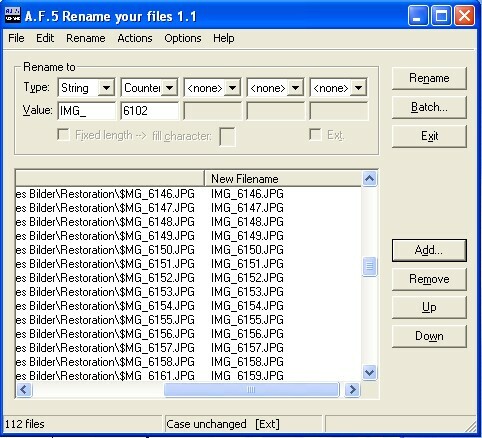 I remembered that I had at one point used a nifty little program called A.F.5 Rename your files (can be found here), which renamed a batch of files without a hitch.